Chord Electronics Indigo review | What Hi-Fi? ‘Open source' is a term the people at Chord Electronics use often. The idea is all about inclusion. In Chord's world, Bluetooth phones, Apple iPods and any other hard-drive or solid-state memory-equipped audio product can be a viable hi-fi source. That's a big step-change in a world where some still have trouble accepting compact discs instead of vinyl. What is the Indigo? The short answer is it's a high-quality analogue pre-amp that contains the latest version of Chord's innovative DAC. But there's more: the Indigo also contains a receiver that will accept a Bluetooth stereo signal called A2DP (Advanced Audio Distribution Profile). Most Bluetooth equipped phones, PDAs and laptops are specified with it, and even the latest specification iPhone has it. This signal allows high-quality stereo sound to be transmitted via Bluetooth, and provided your music files are saved with sensibly low levels of compression – we're talking 320kbps or above – the results are wholly acceptable. Chord also includes a specially modified iPod Classic in the asking price. This is altered to access the digital data stream straight from the internal hard disk drive. The result is a markedly better sound than a standard unit when used in the Indigo's in-built dock or with the wireless RF connection that the company provides. The Indigo can be used in two ways. 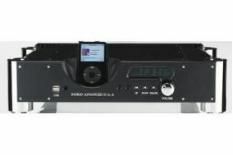 It has a variable output so can link directly to a power amplifier, via either the balanced XLRs or single-ended connection. If you've got an extensive system with multiple analogue sources then the unit's single analogue input could prove a problem, so the other option is to connect to a conventional pre-amp through the Chord's fixed line-level output. We had no issues partnering either Bluetooth sources or standard CD transports to any of the Indigo's electrical or optical digital inputs. Computer users have a USB option, too. We did, however, have a problem with the in-built iPod dock of our review unit, which proved fussy about the docking procedure, often taking a couple of attempts before the portable worked properly. The remote handset works well enough, but we can't help but feel a unit at this price level should have something grander as standard. That said, Chord is by no means the worst culprit in this respect among high-end specialists. Sound quality? As a straight line-level analogue pre-amp, the Chord is impressive. Sound is clean and detailed with impressive agility. The Indigo makes light work of complex music such as Shostakovich's Symphony No.7 and sounds right at home with the likes of Eminem. If it's analysis you're after – really hearing the nuts and bolts of the recording's production – this Chord is a fine choice. Stereo imagining and the sense of scale is impressive, too – few rivals are as precise and focused as this Chord. Be aware though, this unit isn't an overtly sweet listen: if you want warmth or tonal richness, look elsewhere. If anything, the onboard DAC is even more impressive. This is the latest version of an innovative number-crunching circuit that Chord has used for years. Indeed, it's a generation on from the design used in the stunning QBD 76, the stand alone DAC from Chord that impressed us so much back in December 2008. As expected, the design's general sonic characteristics haven't changed, but the latest iteration is clearly superior. It's a phenomenally fluid-sounding circuit that makes CDs sound as natural and unforced as we've heard. Resolution is exceptional, as is bass power and punch. In our experience rarely has digital, and compact disc in particular, sounded so good. No matter what type of music you play or what digital source you feed into the Indigo's DAC, we have no doubt you'll hear more of the music through this than just about any alternative, no matter how much more it may cost. Price-tag aside, this is a product everyone interested in quality hi-fi sound should celebrate. The Indigo points the way to a future where it's possible to make the best of computer-based storage devices within a high end hi-fi set-up. That future can't come quick enough for us.